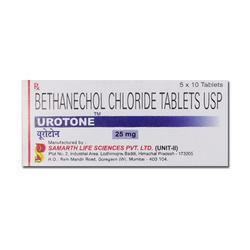 Pioneers in the industry, we offer vesigard, lanthonate, urotone, biosev and urivoid from India. Vesigard is used to treat an overactive bladder. 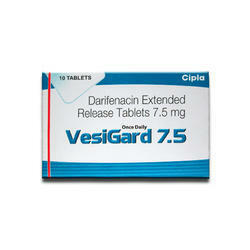 By relaxing the muscles in the bladder, darifenacin improves your ability to control your urination. It helps to reduce leaking of urine, feelings of needing to urinate right away, and frequent trips to the bathroom. This medication belongs to the class of drugs known as antispasmodics. Lanthonate(Lanthanum carbonate, La2(CO3)3), is the salt formed by lanthanum(III) cations and carbonate anions. It is an ore of lanthanum metal, along with monazite. 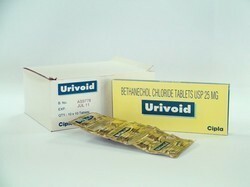 Urivoid (Bethanechol Chloride) is given as a treatment for bladder problems, such as being unable to urinate, or not being able to completely empty the bladder due to surgery or other causes. This drug works by improving the ability of the bladder muscles to squeeze, which in turn improves the patient's ability to urinate. 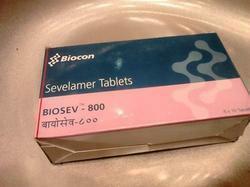 It may also be used to treat heartburn, by helping the stomach muscles move food through the stomach faster. Looking for Kidney Disease Treatments ?